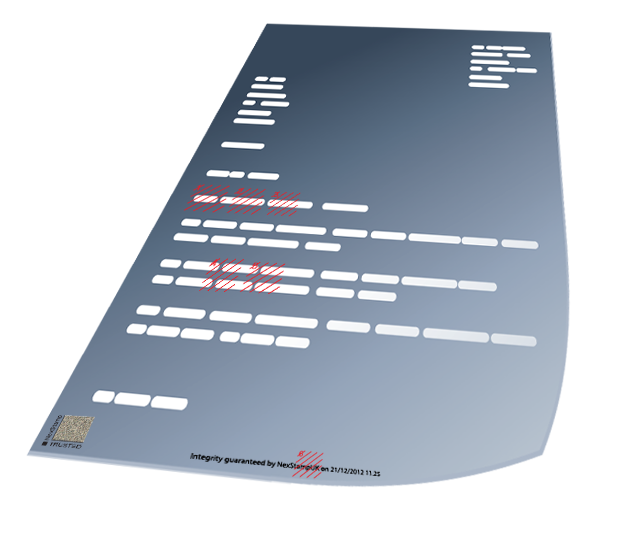 So how does the stamping of digital documents work? NexStamp solved this disquieting problem by employing its unique Digital Stamping Technology (which will detect any alteration — down to the size of a pixel — of a stamped digital document), and implementing the Digital Signature Standard within its Digital Stamps, which subsequently appear on each page of a stamped digital document. Now, and for the first time ever, the signer of a digital document can have multiple and unique Digital Signatures appearing on each page of the signed digital document, so that each such page of the digital document rightfully becomes Self-Attested – as is so with each initialed and signed page of your paper documents. Each Digital Stamp is a very dense 3D-Barcode specific to the data found on each associated page of a document. These barcodes are software-generated and are valid only for the specific data they are generated for. The contents of these barcodes allow us to use them to detect, isolate, and display any changes in the document (down to one single pixel). When affixed to their documents, clients will find that Digital Stamps offer the Assurance and Trust that all mandatory rules, bills, and laws need for compliance. Please click here to view our Supporting Intellectual Properties.